Risk management has moved to the forefront of asset management since the credit crisis. However, most coverage of this subject is overly complicated, misunderstood, and extremely hard to apply. That's why Steven Greiner—a financial professional with over twenty years of quantitative and modeling experience—has written Investment Risk and Uncertainty. With this book, he skillfully reduces the complexity of risk management methodologies applied across many asset classes through practical examples of when to use what. Along the way, Greiner explores how particular methods can lower risk and mitigate losses. He also discusses how to stress test your portfolio and remove the exposure to regular risks and those from "Black Swan" events. More than just an explanation of specific risk issues, this reliable resource provides practical "off-the-shelf" applications that will allow the intelligent investor to understand their risks, their sources, and how to hedge those risks. The theory of risk management is hardly ever spelled out in practical applications that portfolio managers, pension fund advisors, and consultants can make use of. This book fills that void and will put you in a better position to confidently face the investment risks and uncertainties found in today's dynamic markets. 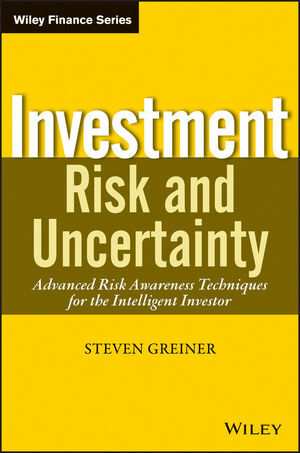 STEVEN GREINER is currently the head of Risk Research for FactSet Research Systems. He has served as the senior quantitative strategist and portfolio manager for Allegiant Asset Management (now wholly owned by PNC Capital Advisors) and was a member of its investment committee. Prior to this, Greiner was a senior quantitative strategist for large capitalization investments at Harris Investment Management. He has more than twenty years of quantitative and modeling experience. Greiner received his BS in mathematics and chemistry from the University at Buffalo, his MS and PhD in physical chemistry from the University of Rochester, and attained postdoctoral experience from the Free University Berlin, Department of Physics. Greiner has published numerous papers and is the author of the Wiley book Ben Graham Was a Quant.